High Speed Rails' impact on America. This past week, President Obama announced $1.25 billion that will be invested in the Tampa-Orlando high-speed rail corridor at a town hall in Tampa, a significant step toward fulfilling his vision of making high-speed rail a legacy of the administration. In addition to $8 billion in high-speed rail funding included in last year's American Recovery and Reinvestment Act (ARRA), Obama has pledged an additional $5 billion through the annual budget process. High-speed rail has been promised for a long time, and the I-4 Corridor is a great place to start. However, I wonder whether or not the $8,000,000,000 dollars that is being spent will end up making a system any more functional than the monorail at DisneyWorld. That $8B is going to be spent very quickly and I for one do not believe that there will be long-term support for spending large amounts on high-speed rail. To me the biggest debate has to be over who will own the system. Do we want a nationalized high-speed rail network ala Amtrak, or do want to have it in the hands of either the states or private investors? Each option has it's drawbacks and benefits. As a railfan, I do believe that America needs a high-speed rail option. I am also glad that we are starting to invest seriously in high-speed rail projects, but I also think we need to be realistic and come up with a long-term source of funding for the high-speed system. Is this a gas tax? A airline tax? Or something else? I don't know. Read about Cindy and my trip toUncle Bubba's this weekend. A good blogread- "The State of a Union"
Mimi's blog about "The State of a Union", not about the SOTU, but more important unions that we deal with everyday. I really liked her comments about Marriage Unions and learning from our partner. Do you like Southern Cooking? DRGW Hoppers Folkston 2008, originally uploaded by Gene Bowker. One of the fun things about railfanning is the chance to learn about the history of the railroads here in the United States. The first part of that is learning the history of the railroad you are visiting. 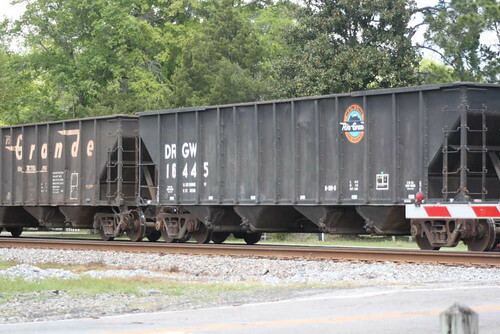 For example, the above photo was taken in Folkston, Georgia in April of 2008 on the CSX tracks there. You can learn more about the predecessor railroads by visiting the ACL/SAL Historical Society website which is dedicated to keeping the memory of these railroads alive. In addition to the tracks, a number of other railroads are always seen on the cars which past. The cars above belonged to the Denver Rio Grande Western (DRGW), but now are owned by the Union Pacific Railroad. The history of the DRGW is a fascinating history of western railroading being based mostly in the Rocky Mountains. To find out more about the DRGW, I recommend visiting http://www.drgw.net/info/ which has plenty of information. Railroads bring rolling bits of history to you as you sit by the rails. Most days you will see a boxcar which you do not recognize the owner of. It might be a small line still in existence or a “fallen flag” or line which has passed into railroading history. Learning about that railroad will always be an interesting journey. Augusta Ducks, originally uploaded by Gene Bowker. 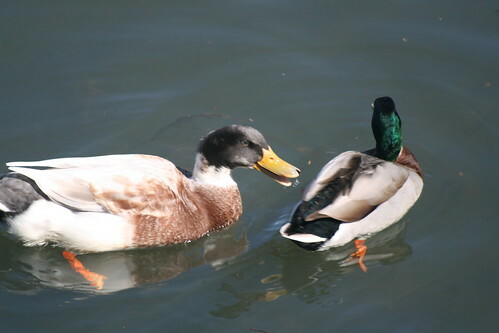 I shot this photo along the Augusta Riverwalk in Spring of 2009 of the two ducks swimming in the Savannah River. When I saw it at first, I didn't like the fact that the first duck's head wasn't turned right, but then I looked at the second one as sort of saw some humor in it. I imagine the 2nd duck as the "wife" duck giving the "husband" duck a "what for" about something. As husbands can do so well sometimes, the 1st duck seems to be ignoring her. Of course, this might not really be what is happening, but heck it is my photo, so I get to make up the caption. What do you see? That is the nice thing about a photograph, each of us can look at the same image and see a lot of different things. What is the "right" thing? To me, it is whatever we (you or me) see in it. In a state so associated with the Civil War, it is hard to believe that there were very few major land battles within the state. 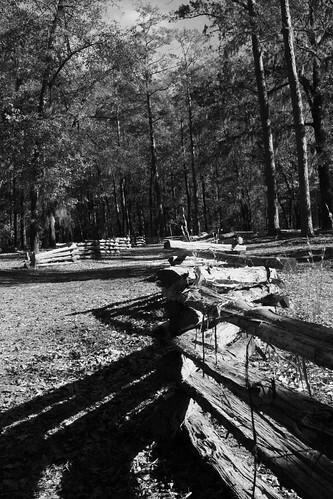 The State of South Carolina only preserves one Civil War battlefield. The Rivers Bridge State Historic park is located in southern Bamberg County. The park combines a memorial area with the preserved battlefield. The memorial area includes a small Confederate cemetery which contains several graves. It is a very peaceful rest under large oak trees. Here is one gravestone of a Private who gave his life. The battlefield portion of the site contains several entrenchments that are in great shape for being 140 years old. If you do visit the park, PLEASE STAY on the trails and off of the fragile earthworks. Beyond being a Civil War battlefield, the Rivers Bridge SHP is also a great nature area. Along the river at the old bridge site, the river peacefully flows by. Birds can be seen along with a variety of other wildlife. To find out more about Rivers Bridge SHP please visit the SC State Parks website . Hamlet Depot, originally uploaded by Gene Bowker. The Hamlet, North Carolina depot is a favorite railfanning spot for me. 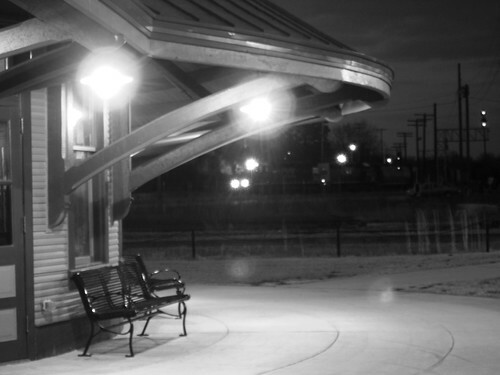 I shot a series of B&W night time photos there trying to recapture some of the feel of times gone by when Hamlet was a hub for Seaboard trains running along the east coast to and from Florida. This shot looks north from the relocated depot toward the Hamlet Terminal yard. There are plenty of locations around the depot area where you can get shots of the depot and the trains in the area. 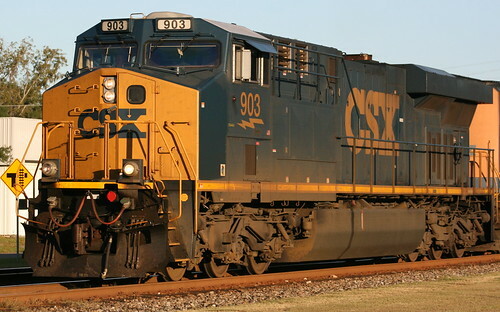 CSX903 SB at Folkston 110709, originally uploaded by Gene Bowker. My first reason for upgrading on the Digital Rebel Xti was for Railroad photography. The thing I hated about my old canon point-and-shoot was the "trigger delay". That time from pressing the shutter release until it actual took the photo. The Rebel is almost instaneous, so I've had to learn not to worry too much about anticipating shots. The morning light in Folkston, GA is perfect for lighting up Southbound freights such as this one led by CSX903 in November 2009. I've diversified my photographic subjects over the last year or so, but Railroads will always hold a special place in my heart. 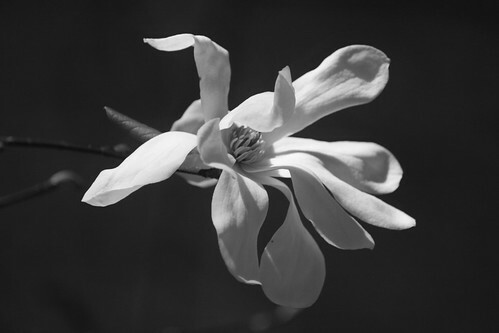 Cindy and I went yesterday to see the Ansel Adams exhibit at the Columbia Museum of Art on the last day of the show. Even though the exhibit was pretty crowded with others enjoying the free admission, it was wonderful getting some of his most famous prints in person. 1) How much more impressive they are in person in larger-sizes and also being there in person. Books really do not do justice to the quality of contrast which Adams was able to acheive in his photos. This was due to his zone system of photography which is explained by him in his books. 2) How much his style changed over the years, while still having the "Adams" flavor. Some of the later photos exhbited became more statements of "art" than landscape photographs. This is because of Adams' life long pursuit to make photographs be seen as artistic not only as reporting facts. I'd recommend that any photographer, or lover of art who gets a chance to see Adams work in person take that opprotunity, you will not regret it. 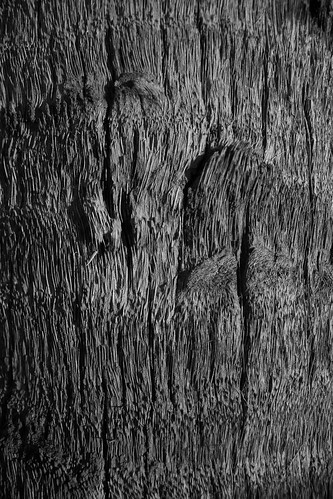 Palm Bark BW, originally uploaded by Gene Bowker. While I was in Florida, I was taking some sunset photos along Tampa Bay. I noticed the texture of the palm tree's bark and thought it contrasted well with the pine tree bark I'd seen before. 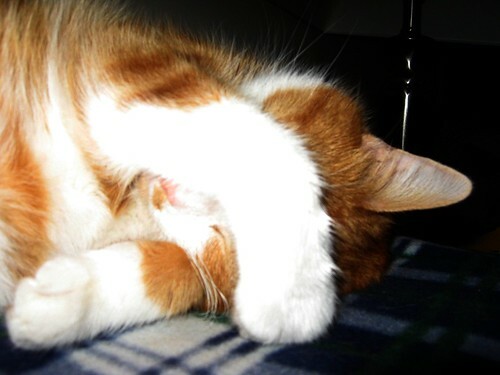 Camera Shy, originally uploaded by Gene Bowker. "Little Man" is our younger cat or FID (Furry Kid). He has many roles in our household. He is the alarm clock on Saturday, when he decides it is time to get up. He is the antagonist of his older sister, Meesha. Meesha doesn't always appreciate the attention. He is the offical "bird-watcher", as he'll spend hours watching the birds outside from the porch, or from the living room window. 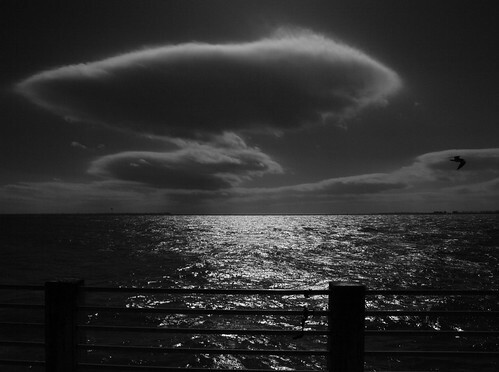 Clouds Over the Gulf, originally uploaded by Gene Bowker. This is one of the photos I took at Fort Desoto in Pinellas County, Florida over Christmas Break. The sun was tucked behind the cloud.. and the gull flying into the pic seemed to add to the high-contast feel of the actual scene. It was really windy which added some waves to the Gulf, which is rare. Flower Augusta Riverwalk Twitpic, originally uploaded by Gene Bowker. Shot in Augusta, Georgia last spring, this reminds us that Spring will always come. Take time to slow down and look at the beauty which shows itself to those who will look. 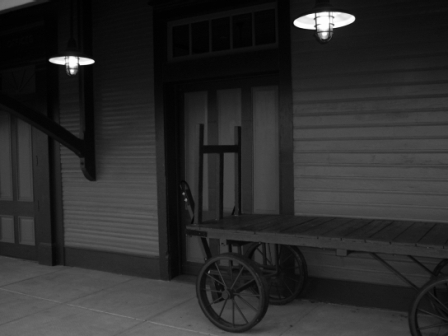 The empty cart sits next to the Hamlet Depot waiting for the next train to come in. When you visit the depot today, it is hard to believe that Hamlet was once a hub for rail travel in the Southeastern United States. Name trains from the Seaboard Air Line such as the Orange Blossom Special called at the station which once included a large hotel. 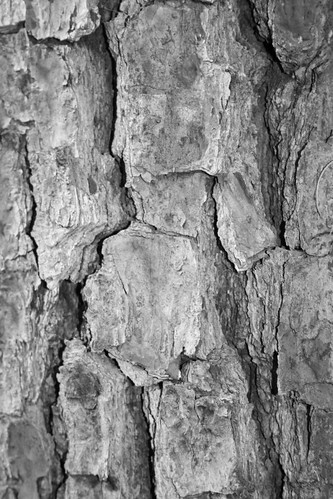 Bark, originally uploaded by Gene Bowker. This year I'm working on concentrating on the details of life. If you always look at the forest, you can miss how lovely the detail of bark on one tree can be. This also applies to my life, I tend to start many things that I don't finish. I'm going to work this year on following through and completing tasks. Private John Woods 3 SC CAV, originally uploaded by Gene Bowker. Remember on Military Monday and everyday to show your support to our troops who are serving around the world. PVT John B Woods, Company C, 3rd SC Calvary, CSA. 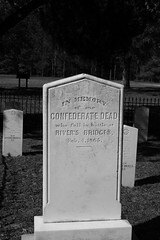 Killed in action Feb 2nd, 1865 in action at Rivers Bridge, South Carolina. 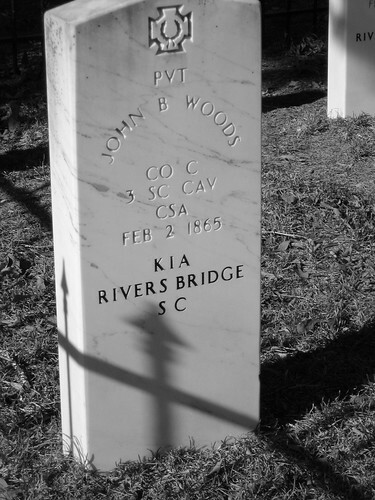 I worked with a John Woods here in South Carolina. The picture represents just a soldier in the conflict. A private, not a General, who fought and died for the cause that he believed in. Flower detail BW, originally uploaded by Gene Bowker. This is symbolic that we can have rebirth in our lives. 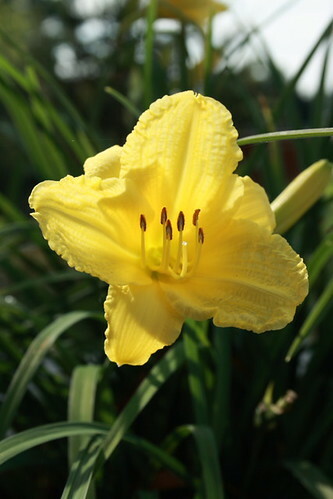 When circumstances have reached the winter point, there is always a chance for a new spring. We just have to focus on what is important, and concentrate more on the details of life to discover it. Shot on Augusta Riverwalk in Spring, 2009. African Violets BW, originally uploaded by Gene Bowker. 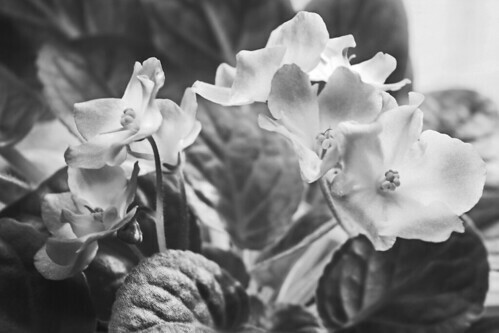 My B&W version of my photo of Cindy's African Violets in our kitchen.